By 1916, more than 100 railroads throughout the country, including the Pennsylvania Railroad, the Lackawanna, The Chicago, Illinois Central, some New York Central lines, as well as the Pullman Company had entered into contracts to sell the Luellen and Moore’s products. The company soon expanded its market to drug stores and soda fountains. The flu epidemic after World War I put paper cups in even higher demand (Voss-Hubbard 1995). At a time when developmentally disabled children were sent away to institutions for the rest of their lives and the diseased were sent to sanatoria, this was another measure to prevent the intermingling of the sick and the well. At a time when the causes of disease were understood only vaguely by the scientific community and not at all by the American public, infection and carrier were more closely related on a philosophical and perceptual level than they are today. According to the popular imagination, some personalities were typed to particular diseases. 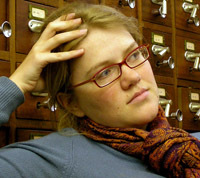 This thinking could work in two ways – a sensitive, “nervous” person could be more prone to hysteria, for instance, or a group of poor immigrants could be identified as intrinsically messy and smelly–without the social supports to treat disease, the notion of the sickly poor could not be tested. In her now-canonical 1977 extended essay, “Illness as Metaphor,” Susan Sontag explores how American society has treated disease and the diseased, and gives a nuanced analysis of cultural portrayals of tuberculosis patients. 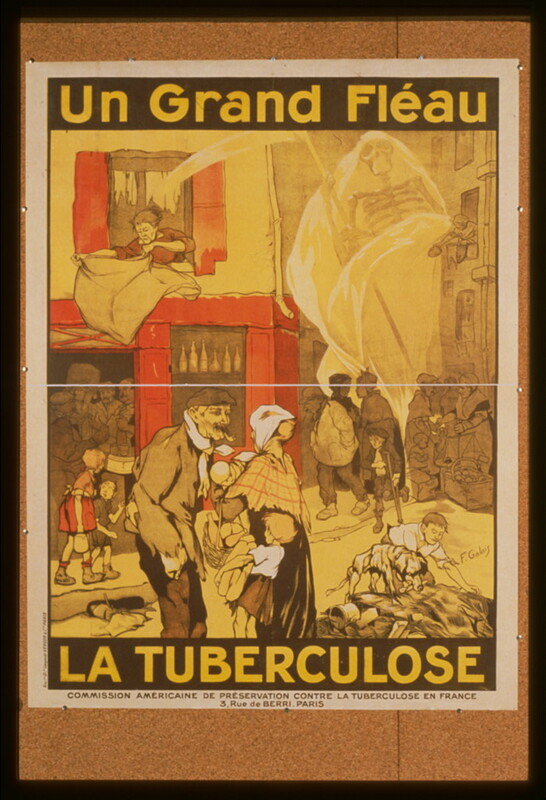 Until TB was eradicated by antibiotics in the developed world, its causes were associated with a particular kind of patient and its patients were ascribed particular characteristics, most notably disorders of passion. As the disease’s symptoms provoked common appearances and reactions among its patients and those infected reacted accordingly and similarly, a recursive effect of patient-symptom-behavior-personality-patient reinforced ideas of who a consumptive was. This disease changes the patient not just corporally, but also, and inextricably, spiritually. 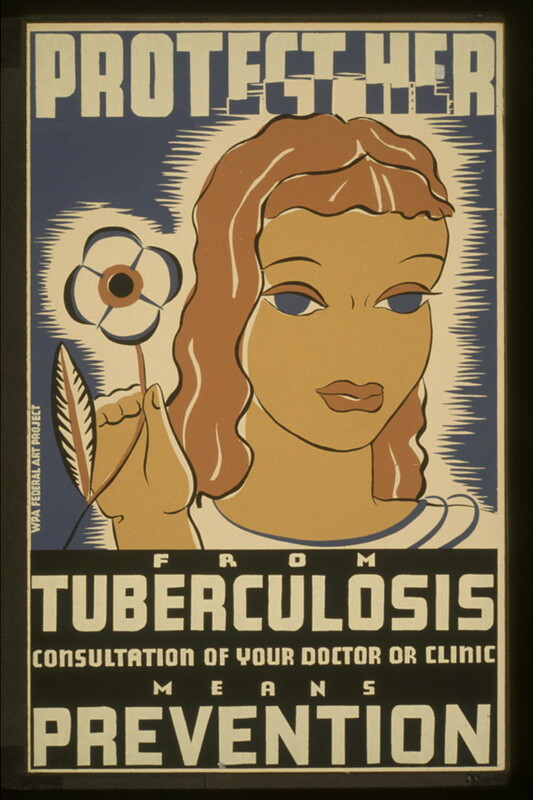 A person suffering from TB is therefore not just a patient–she is a type. How, then, is the consumptive treated by her (and most often in literature her, although a feminized him is also usual) family, friends and doctors? How hard do we work to cure a patient if her disease makes her more beautiful, more peaceful, and more spiritual? How tempting must it be for a romantic-era family to attribute the horrifying pain and wasting of this disease to the will of some god? 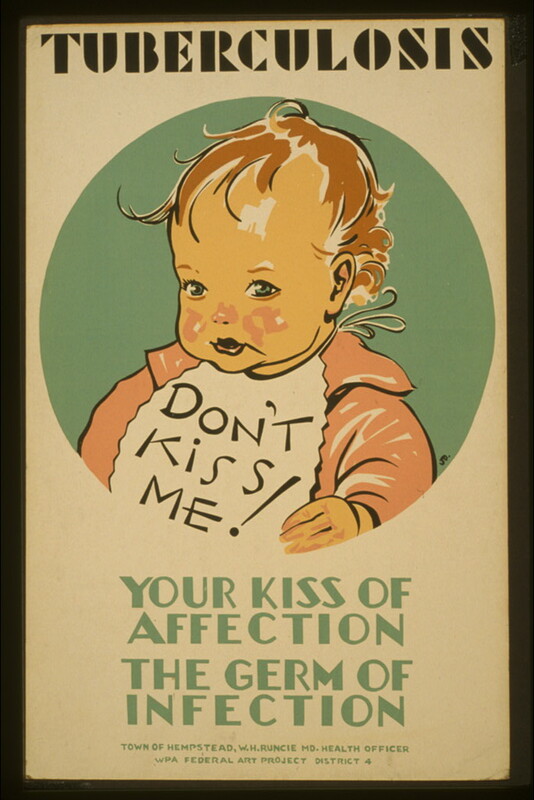 Early 20th century germ culture was marked by an overwhelming belief in self-control. The Journal of the Outdoor Life, a periodical to promote “persons seeking health by an outdoor life, and particularly to disseminate related information looking to the prevention and care of tuberculosis” included lengthy lists of how consumptives should behave in all contexts and how to care for all parts of one’s body. “Never swallow your expectoration. It is dangerous for you,” according to one particularly earnest piece of advice. This article also advises to eat eight raw eggs and six glasses of milk every day reminds readers that “while amusements are necessary for all human beings, the person who has not the grit to deny himself pleasure for profit, has not got the ability to succeed in anything” (JOL 1909). The journal also included inspiring biographies of consumptives, including Robert Louis Stevenson, reports from sanatoria, designs for sleeping porches, poetry, and lists of books by consumptives and about consumption. The publication was written for the wealthy and held a strong disdain for the poor. An article by Mary Lent, RN, about her work with the poor, promotes the idea of two types of consumptives, rich and poor. In the first place, there is the instruction of groups or communities by means of leactures, exhibits and the press. The people reached by this method are well above the poverty line, and their habits and circumstances of living protect them as a rule against tuberculosis, which is found among them only incidentally, tuberculosis being essentially a disease of poverty. The second method is the instruction of individuals, themselves tuberculous patients, belonging to the class which the disease claims as particularly its own–namely, the poor…. The experience of four years of continuous work in the homes of tuberculous patients of the class under consideration has demonstrated to me that the results hoped for have not been obtained and moreover are note obtainable… there is now no part of Baltimore where instruction concerning tuberculosis has not been given…. These people are unable to apply what they have learned consistently and unflaggingly in their daily lives–an inability due in the first place to lack of sufficient moral strength, in the second place to the lack of the material necessities and requisite surroundings. Lent goes on to explain that the only true hope for the consumption problem is to separate the cases that are unable and unwilling to care for themselves, and that the nurse’s task is not to teach these communities to prevent and care for TB, but rather to teach them to submit cheerfully to separating from a loved one and sending him to a hospital. This entry was posted in Uncategorized on June 5, 2008 by Jason. People usually wash glassware before using it. Not so with paper and plastic. What do these products pick up in the manufacturing process? Are pots, metalware, and glasses really “dirtier” than paper and plastic? Who has handled them?